“A big thank you to both MatchPoint you and the Franchise Company I am now a part of. After I attended your seminar I realised that franchising was a good option for me to investigate. The presentation was informative and provided an insight into the range of franchise opportunities available. Most people’s experience of franchising are usually big brand retail options, Subway or McDonald’s and you were able to highlight a variety of franchise opportunities that did not fit that stereotype. “I liked to work with Josue. The MatchPoint consultant demonstrated great insight, empathy and in my case patience in advising on what is undoubtedly a major decision for anyone considering taking the step into business franchising. I have no reason to question the advice of one of my potential franchisors, that my MatchPoint consultant is one of the best franchise consultants in the UK. Director, Sales Training Franchise. Helping Businesses with Sales skills. I worked with MatchPoint to uncover franchise ideas that would fit my experience and interests. My consultant has the uncommon combination of personality and competence, affability that gets results, a listening ear and an organized approach. He uses his whole self and arsenal of knowledge to really connect with his clients to help them not only find a profitable business, but one that they will actually be HAPPY in. I not only recommend him, I want to be like him when I grow up! Thanks for a great experience my friend! Three months ago, prior to MatchPoint reaching out to me to explore franchise business opportunities, I would have responded “no way” about operating a franchise. I’ve always started and grew businesses up to $127 million the hard way. A MatchPoint consultant opened my eyes to franchise possibilities. He was consistent, expertly informed, and of good character to work with. He assessed my interested and expertise to match us to three opportunities. We chose an in-home learning service company that has the right characteristics to meet our desire to help students succeed, what we like to do, our financial resources, and our financial goals. This is my first business startup where I am tapping into vast expertise – the core business methods work, the parent company is actively involved, and there is a strong network of owners to share methods and pull with. Talk about life changer, thanks to his guidance. “Tuve la oportunidad de recibir apoyo de Ivana durante un período en el que estuve explorando la posibilidad de adquirir una franquicia. Su profesionalismo, ética y soporte fueron extraordinarios, siempre me sentí respaldado por ella, tiene un enfoque al servicio de sus clientes que me parece de destacarse. I worked with MatchPoint for several months and wholeheartedly recommend the consultant I worked with to anyone who is considering purchasing a franchise. He provided me with a clear and thorough understanding of franchising and helped me determine the types of franchise for which I was best suited. He then provided me with quality franchises that matched my interests. He is easy to work with, displayed a high degree of integrity, and always followed through on his promises to provide me with information, introduce me to the appropriate franchisor contacts, and call me as scheduled. I could not have worked with a better or more professional franchise consultant. MatchPoint supported my quest to learn about prospective franchises in which to invest. I believe very strongly in the process that they directed so that I could perform an intelligent analysis which enabled me to complete the due diligence I knew was necessary for me to complete my decision. Detailed, support materials were components of the process that were shared by my MatchPoint consultant and these facilitated my learning while gaining answers from the franchisors. The result of his “consultative” approach has given me confidence and assurance of my decision. We completed the effort at my pace and I am convinced that his guidance and energies will translate in a favorable business venture for me. He maintained follow-up with me based upon my preferred schedule and our exchanges of business strategies has confirmed that my decision is ideal based upon my exact personal profile. Thanks to him for his good work. After my separation from my previous employment with Liberty Mutual, I was in investigation mode to determine my next career path of choice. That’s when I met my MatchPoint consultant. As I requested information from a website seeking information on self- employment, I got a phone call from MatchPoint. This initial phone call turned into a series of conversations with him spanning nearly 6 months. During these conversations, he introduced me to a wide variety of self-employment opportunities that were out there. Though I had many reservations about buying my own business, his professionalism, experience as a business owner and his ability to educate me and instill confidence in my decision making enabled me to purchase my business. He continued to guide me and was very supportive of my business decision. I am thankful for having learned a lot from my continued relationship with him as he is truly there to help people succeed in their business growth with a passion that is matched by few. If there is anyone that is looking for self- employment opportunities, it would be a mistake not to work with the MatchPoint team. My MatchPoint consultant is an extremely knowledgeable and personable franchise professional that made my dream to leave corporate America and start my own business a reality. He has a unique enthusiasm for people and life and worked with my wife and me many nights around our busy schedules. 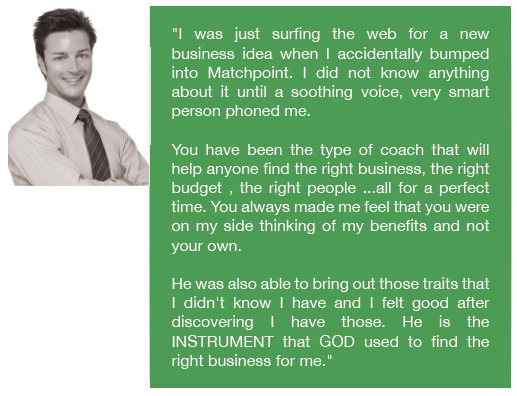 Without him, I would not have been able to truly find the business that matched my goals, strengths, values and financial goals. There are so many franchises out there that have a lot to offer but he truly peeled back the onion to help us find the exact match that we were looking for in a business. If you are thinking about joining the franchise world, I can’t think of a better person or organization to work with and recommend. I would highly recommend MatchPoint to anyone who may have an interest in becoming a franchise business owner. My consultant is a professional who possesses a vast amount of knowledge and an understanding of the fundamentals and characteristics that represent a successful franchise business. He will never intimidate, steer or persuade you into a decision where you are not comfortable. He remains neutral and shows no favoritism to any franchiser. He is very personable, approachable and communicates very well. Most important, he is trustworthy and will have your best interest at heart. The MatchPoint consultant I worked with is a Career Coach who took the time to learn who I am from a personal and a professional perspective. He took the time to complete various analyses to understand who I really am and what my inner desires really are. The relationship we developed in a very short period of time could only have been achieved by someone who was looking at me from an interpersonal perspective. When he presented me with some alternatives he presented a variety of alternatives which I found all of them to be ones I was interested in. One in particular was one which I found to be extremely exciting and filled every one of my wants from a business and personal perspective. If you are looking for someone who can provide you with strong guidance to aid you in selecting a good business then you will enjoy working with MatchPoint. After initial skepticism about franchising I was taken through a very professional process by the MatchPoint consultant and am now embarking on a new career in franchising. The MatchPoint consultant I worked with has a profound ability to develop and sustain meaningful, and long-term, client relationships and is a dynamic and unparalleled speaker and author. I have had the great pleasure to attend several of his lectures and found the information immediately useful. He has an uncanny ability to impart decades of subject matter expertise into immediately actionable items that are results driven. He is an absolutely invaluable resource and has proven to be an asset to everyone he consults. I would highly recommend MatchPoint to anyone interested in exploring the world of franchising! My senior consultant did a great job of matching my goals with the business models available. Also, during our many conversations I felt like I was working with a friend. I was at the crossroad of making the decision to continuing a job search or starting my own business. I had explored franchise concepts on my own, but felt I should take a step back and get some help in addition to making sure I had not left any stones unturned. That is when I discovered Match Point and was introduced to a consultant. We hit it off immediately and I found his insight, instincts, and understanding of my personality, background, and motivations to be invaluable as we searched for business models best suited for my long term success and happiness. If it was not for this consultant, I would have missed a great opportunity right under my nose. I appreciate his honest and straight forward approach. 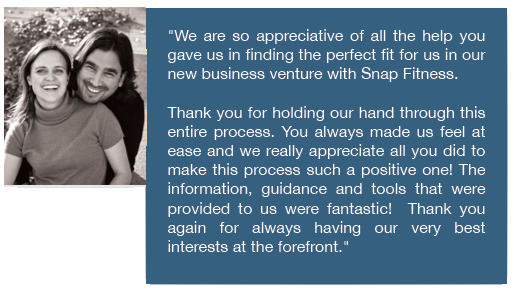 Having him by my side gave me the confidence to take the leap of faith into business ownership. I am excited to start this new chapter in my life and I am thankful to have found a new friend in the process. My MatchPoint consultant is an experienced, knowledgeable and passionate advocate of franchising. Yet he remains objective and grounded helping individuals evaluate the franchising route, and whether it is right for them – his experience allows him to provide surprising perspectives and insights, both into business and on self-reflection. He is a professional of high integrity; his open, honest, relaxed manner together with his desire to help others live their aspirations makes engaging with him a fun, rewarding and an enlightening experience. I could tell that my MatchPoint consultant balances taking his job seriously with a personable, easy-going style. He demonstrates deep interest in both the franchise community and the individuals he is working with. In my contact with him, he presented ideas that both matched my line of thinking and developed it further in a productive way. His franchise clients that I met also rated him highly. I trust his judgment and would recommend MatchPoint. My MatchPoint consultant is highly professional, reliable and business savvy. I found the work he did with me on reviewing the franchise market extremely valuable. I met my MatchPoint senior consultant by chance when looking at embarking on a new career. My initial reluctance to engage in a dialogue evaporated after our first conversation. He took the time to truly listen and understand my strengths/weaknesses before making any recommendations. He gladly continued the consultative process for months before I made a final decision. One of his greatest attributes is keeping his client’s best interests in mind which is invaluable when making a major career transition. I will continue to use him as a sounding board in the years to come. I first began consulting with MatchPoint this year when I began due diligence on possibly buying a franchise. With over 1,500 franchise opportunities in the US alone, the process is daunting at least! My consultant and the MatchPoint system took the mystery and guesswork out of the research. With his years of experience and franchising expertise, my fears were quickly alleviated. His mentoring helped me identify opportunities that fit MY UNIQUE REQUIREMENTS. His integrity, professionalism and coaching made buying a franchise one of the most rewarding professional experiences I have encountered. My MatchPoint consultant is an extremely experienced businessman that has the great ability to listen and understand the person as well as the problem or circumstance. He is a great communicator and very quickly helps the individual recognise their strengths and what they need to do to move forward. He acted as my mentor when I joined a new organisation and I found his experience and wisdom a huge benefit to me. I really looked forward to our meetings. He is a great coach coupled with a huge amount of business experience. I would not hesitate in recommending him or MatchPoint. MatchPoint consultants add value to people. Mine in particular doesn’t know what it means to think “I can’t” but rather “I will” and “I can”. I’ve never heard a negative word come out of him from the time I have known him, rather always this winning attitude. He provides good advice to those who engage with him and value to those who need it. My MatchPoint consultant has an acute mind and speed of light ability to quickly identify the critical issues facing a business. Give him 10 minutes and he will have got his hands around the core strategic issues, and you will have invaluable clarity and insight. He is the man to go to if you are looking for Franchise opportunities and he will find the right one for you. He is also a CMT Master Coach, and his open and honest approach gives his clients the advantage of working on the leadership issues that make a difference. The MatchPoint consultant I worked with has a unique knack of asking the right questions to glean the right answers. When he touches your life you will never forget him. He’s a genuine person who wants you to succeed. By using wit and a sharp mind he can teach you how to move forward and grow in whatever decision or endeavor you are considering for yourself. I had the pleasure of working with him for a time and came away confident in myself and better equipped at making future business relations work. MatchPoint has consultants who are top performers world-wide. Many are great mentors and great coaches! They have extraordinary listening skills and coaching experience. Definitely, some of the best Consultants I´ve ever met!